Training with a power meter is the current gold standard for measuring improvement in performance and setting standardized goals for workouts. Cycling is not classified as a contact sport, but you will likely make contact with other cyclists or their bike during races or group rides. When sprinting, you should follow these tips. 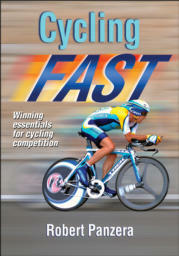 Cycling Fast covers the latest information on new high-tech racing frames, training with a power meter and heart rate monitor, coordinating your tactics as part of a team, and much more. Learn how to periodize your training and use the tips, charts, and checklists to ensure your success at the finish line. Robert Panzera, MA, is a USA Cycling certified coach and NSCA-certified strength and conditioning specialist. In 2009 he received his master’s degree in kinesiology with a specialization in biomechanics. Panzera is a competitive cyclist in road, track, and cyclocross events. He is the owner and operator of Cycling Camp San Diego (CCSD), which specializes in week-long training for serious road cyclists. The camp is particularly popular with performance cyclists who want to make the leap to racing. During the camps, participants typically ride more than 60 miles per day with total elevation gains of 4,000 to 8,000 feet. Panzera and CCSD take pride not only in physically training cyclists but also in preparing them to race via instruction in bike handling, nutrition, and cycling psychology.